This set of photos was taken on July 11, 2017 at 5:02 AM. 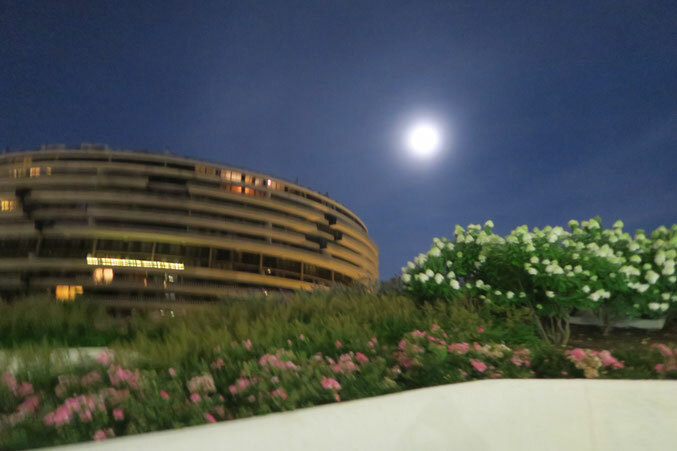 The location was the main entrance to the Watergate Hotel in Washington DC. The "Take it!" came from my returning to my car and looking up - to see the full moon. 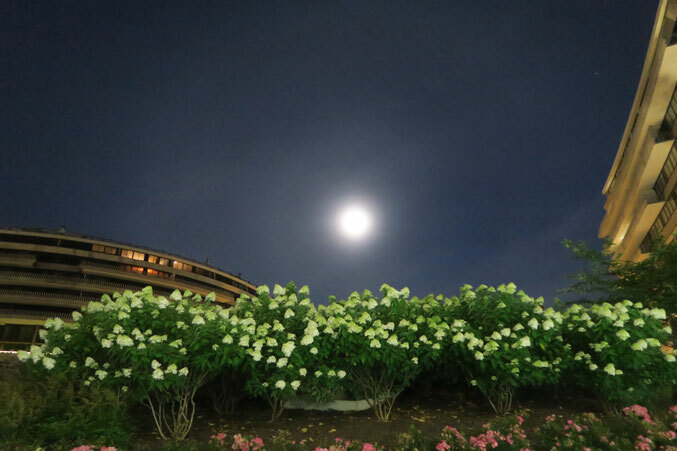 The moon above the roses made a nice shot and leaves the viewer wondering if there was a prevailing sweet fragrance as a part of the setting. The second photo is the actual preferred photo but is out of focus enough to almost not use it at all. Sometimes - I do not get the focus just right - and this happens to be one of those times. Pushing ahead with the reasons for the preference - the moon was above an intersection of curves made by building and plant life. The second thing that was captivating was the string of lit Christmas lights on the railing of a balcony of a unit on an upper floor in the Apartment section of the complex. Things like not taken down Christmas lights which are still lit in July, are from my experience associated with folks of lower incomes. The accommodations in this world famous complex are quite expensive. Ah well, If this makes someone happy - so be it. The After Take: To everyone I showed these photos to - they all enjoyed the story attached. Here is hoping this little bit of a mix brings a smile to your day as well. Hey Everyone! Just a quick update. Bruce had a quick surgery this past week. During his recovery period we will only be posting one new photo each week. Once he has recovered we will go back to two per week. Hope your surgery went well Bruce. Our thoughts are with you for a speedy recovery. Wow what a beautiful full moon. Gorgeous photos! Was your surgery a success? Here's hoping you're back on your feet soon. I'm having back surgery in a couple months myself. That moon is really lighting up that sky. You have my thoughts and prayers Bruce. Is this where the Watergate Scandal unfolded?